Vegan food rocks. We know that, and have done for a long time. 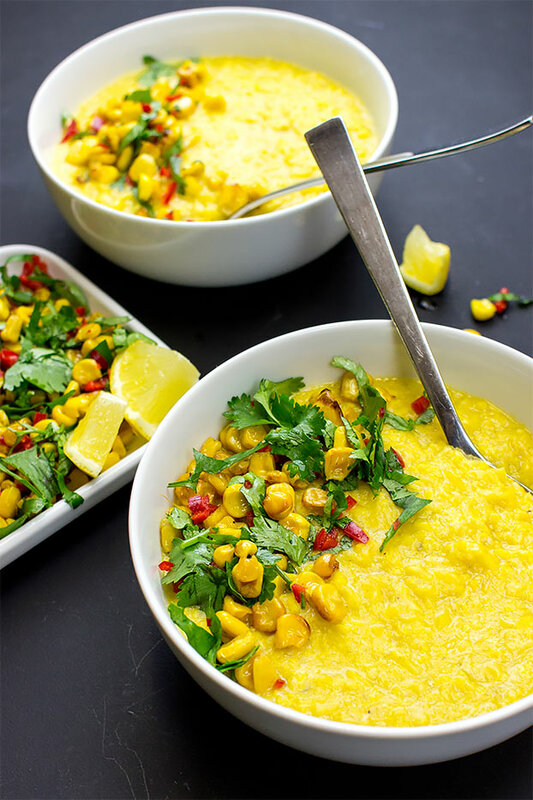 But to some, and even with awesome recipes like this roasted & creamy corn soup, vegan food still has a stigma to get over. It shouldn’t be that way, but it is. No matter, we’re here to change that. 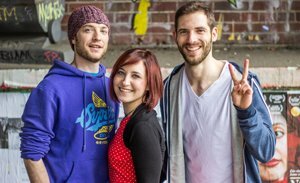 Our mission, as it has always been, is to show the world just how good vegan and vegetarian food can be. 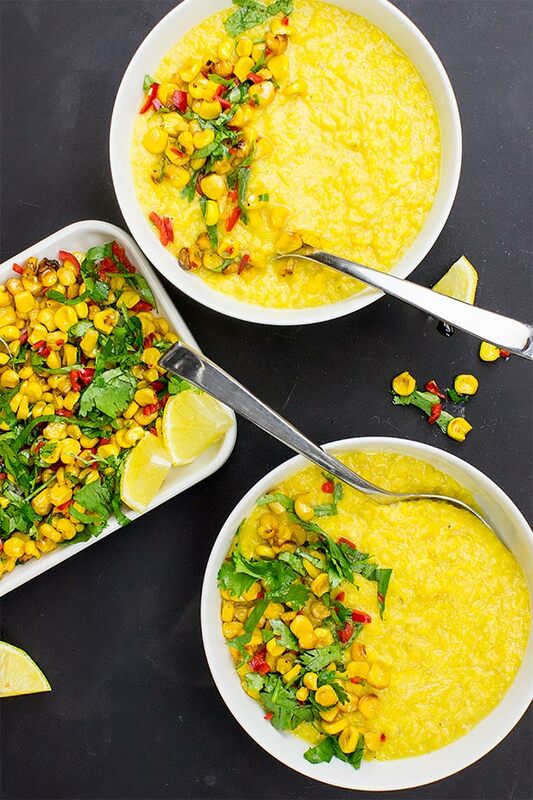 This creamy corn soup is one just example. It’s light, it’s tasty, it’s creamy – and it’s satisfyingly filling! 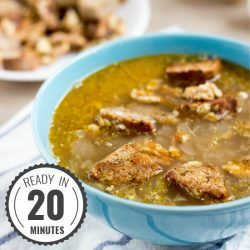 Many vegan foods are noted for not having enough bite to them – the same can absolutely not be said of this corn soup. 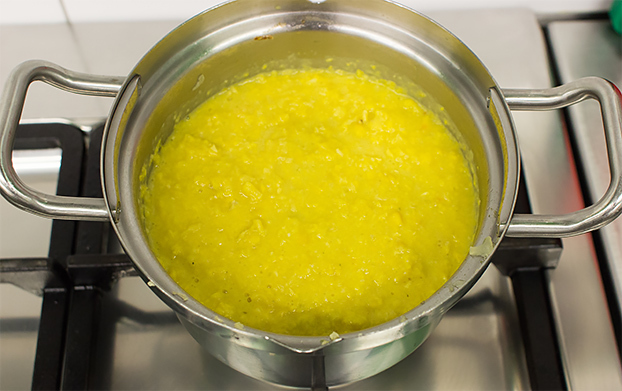 Some of the sweetcorn is cooked in a pan, the rest is deeply roasted in oil, salt and pepper. It gets dark, rich, and so frikkin’ tasty! 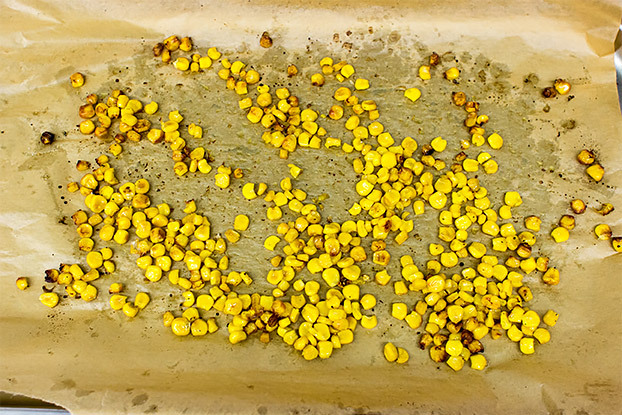 The icing on this proverbial cake is that very same roasted corn – with its rich, oily taste. Then we mix it with some chili and coriander for a taste explosion. And if chili isn’t for you? That’s fine – use a little red pepper, instead. Less spice, more nice. Convinced yet? You will be after you try it! 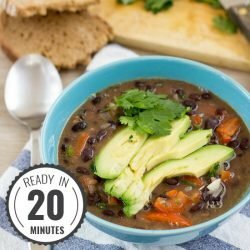 The creamy corn soup leads me on to another topic: the 30 Day Vegan Challenge! We’re incredibly proud to be launching it this month, and we want YOU to join us! As well as showing the world just how great vegan food can be, we want to show just how easy it is to go vegan. It is our belief that the factory farming world has gone insane, and is heading further down a dark and dangerous path. But WE can make a difference – and the 30 Day Vegan Challenge is a great place to start. *Don’t like spicy? Deseed the red pepper before cutting it. Hate spicy? Replace the red pepper with ¼ of a red bell pepper, cut into tiny pieces. You’ll need an oven and a baking tray or oven dish, a big pan, and a (hand) blender. Heat up the oven to 430°F/220°C. Drain the corn but save the liquid from the can in a separate bowl! 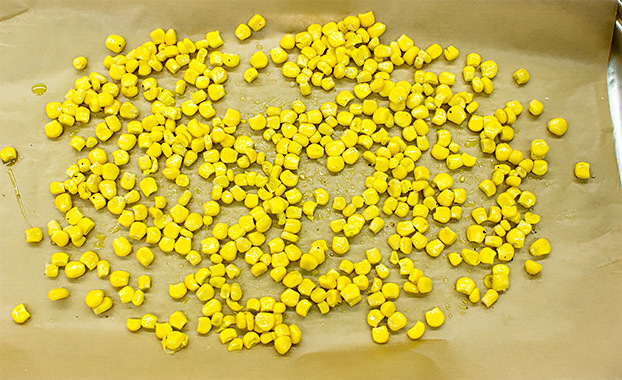 Add ⅓ of the corn (without the liquid) to the baking tray. Sprinkle with some oil, salt and pepper. Put it in the oven for about 10 minutes. Stir occasionally and make sure that the corn doesn’t burn. In the meantime, heat up the other tbsp of oil in a pan on medium heat. Chop and sauté (slowly fry) the onion. Peel and chop the fresh ginger and add it to the onion. (If using dried ginger, hold off a moment). Stir for a minute. Chop the garlic and add it to the onion. On low heat, stir for about 30-60 seconds. If you’re using ground ginger (and optional: ground lemongrass) now’s the time to add that to the mix, and stir for about 30-60 seconds. 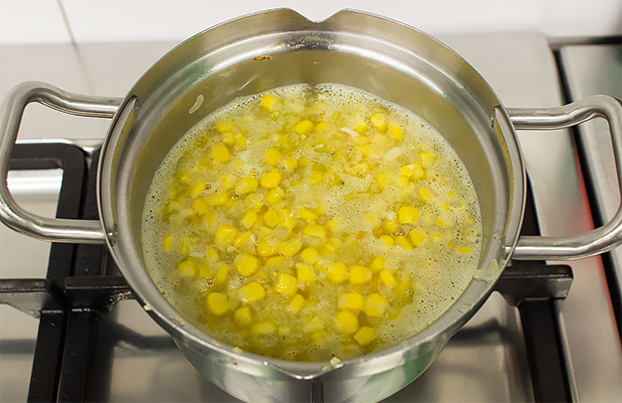 Add the other 2 cans of corn (with the water/moist/broth from the can) and the liquid you’ve set aside earlier. Also add the vegetable broth and bring to a boil. If you’re using fresh lemongrass: Make small incisions into the lemon grass and add it to the soup. Or use a wooden spoon to smack the lemongrass a few times. You will take them out later, as a whole, so make sure that they stay in one piece. See video here on how NOT to beat lemongrass. Let the soup simmer on low heat for about 10 minutes. Keep checking on your oven roasted corn. In the meantime, cut your coriander and slice your red pepper in tiny pieces. Deseed the red pepper first if you don’t like it spicy. Once the roasted corn is done (nicely brown, sizzling, popping here and there), add it to a bowl together with the red pepper and coriander. Mix it well. After ten minutes of simmering, remove the soup from the heat and blend it (a hand blender is perfect) until it’s (kind of) smooth. 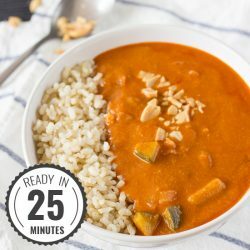 Serve the soup with a tablespoon (or two!) 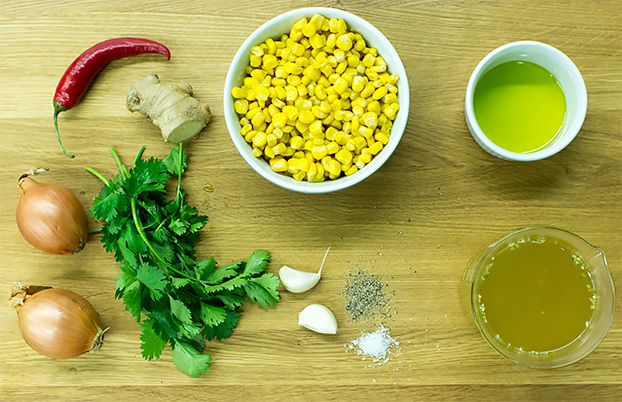 of the corn-coriander-red pepper mix in it. 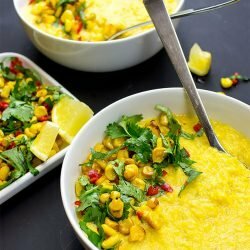 This recipe is inspired by Maria Elia’s ‘Lemongrass and sweetcorn soup with crème fraîche’, from her highly recommended cookbook The Modern Vegetarian (veggie, but it does have some vegan recipes in it as well, and a lot of recipes are adjustable to the vegan diet). This sounds scrumptious. I want to make it with fresh corn. 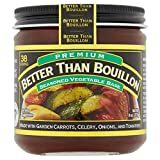 What do you suggest to replace the canned corn liquid? Fresh corn will be lovely, I would just use some more veggie broth. The total amount from the three tins is probably one cup, max. I’d start with that, and then just add a little more if it seems too thick. 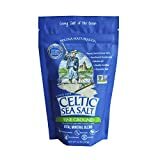 Can I use dried coriander spice in place of the fresh coriander? If so, how much do you think I should use? Hi Lori, absolutely, yes. I normally use about 1/3 the amount for dried vs fresh. So 2 handfuls fresh would be about 2 tsp of dried. I’ll update the recipe now to show that. Thanks, and enjoy!